0-13 Kg, birth to 18months approx. Koos is the new solution from Jané for group 0 . Koos is the infant car seat that combines an extremely light weight shell with maximum safety. Made using breathable materials, Koos is very comfortable for the baby and easy to handle for parents. Lightest infant car seat at only 2.9 kg. Group 0plus, 0-13kg, from birth to 18 months approx. PROFIX system (patented) locks and unlocks car seats with just one movement, eliminating the need to buy awkward fitting kits. Fitted with a car seat belt lock so it can be tightened to provide greater stability. 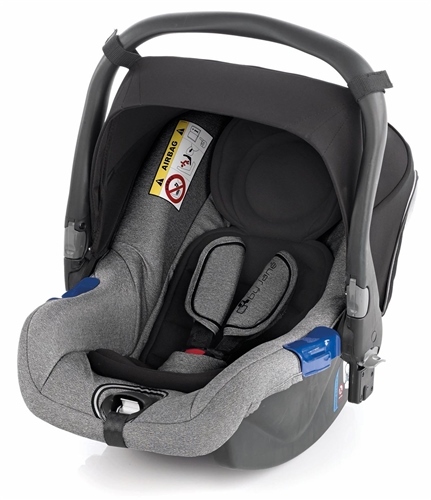 Infant car seat Group 0plus (up to 13kg), ECE R44/04. Pro-fix system that means you can easily fit it on and off any Jané chassis. Polypropylene injected body that is very resistant to impacts. Attaches to any Jané Pro-Fix Compatible Pushchair or Chassis to make a travel system with just one movement - (no fitting kits required). Also Compatible with these older models: Slalom R, Slalom Pro, Slalom Pro Zero, Cross R, Aniversario, Solo R, Solo, Unlimit, Nomad, Carrera Pro, Twin Two.